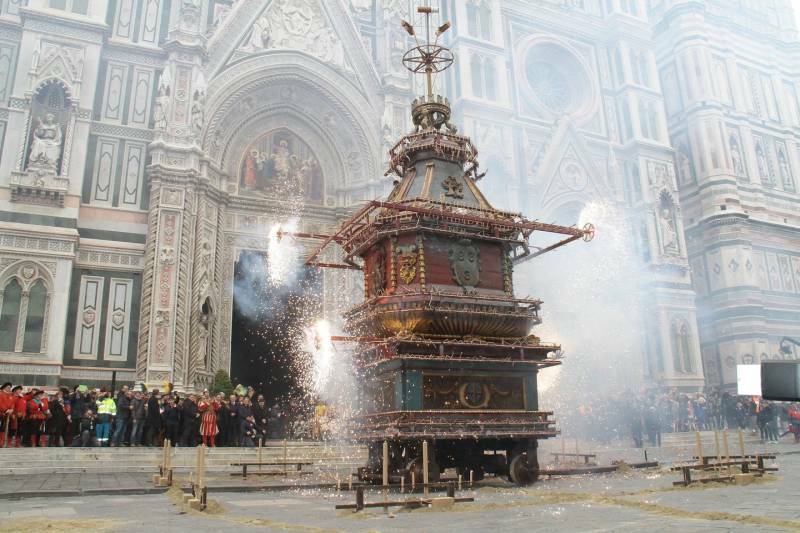 One of the oldest folk traditions in Florence is the “Explosion of the Cart”, Scoppio del Carro, which is held on every Easter Sunday. Its origins go back to the First Crusade when Pazzino de’ Pazzi, a member of the well-known Florentine family, was the first man to scale the walls of Jerusalem in 1099. For this act of bravery he was rewarded with three flints taken from the Church of the Holy Sepulchre, which were carried back to Tuscany and preserved in the Church of Santi Apostoli. It became the practice to strike a “holy fire” from these flints during Eastertide, which was then carried throughout the city by groups of young men bearing torches. 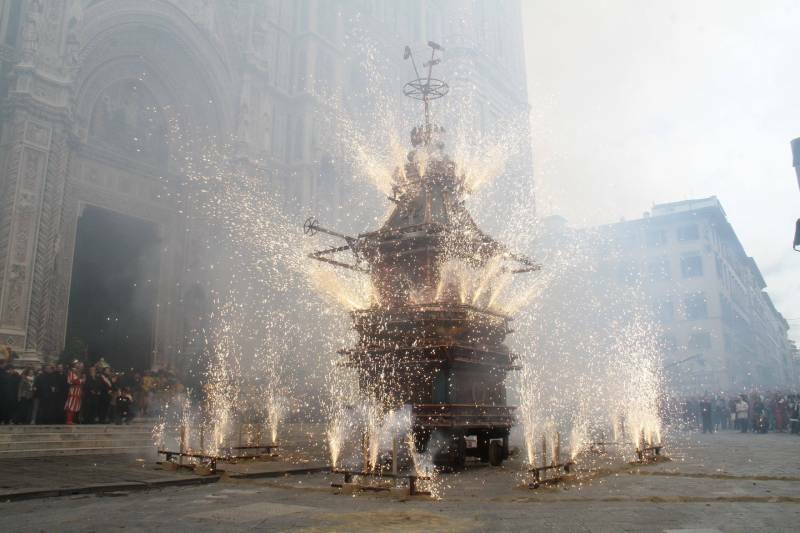 In time, the tradition evolved and a cart bearing a large candle was rolled through the city to the cathedral, from where the holy fire would be distributed. By the end of the 15th century, the Scoppio del Carro assumed its present form. In fact, today the tradition is to light a cart packed full of fireworks on the morning of Easter Sunday. 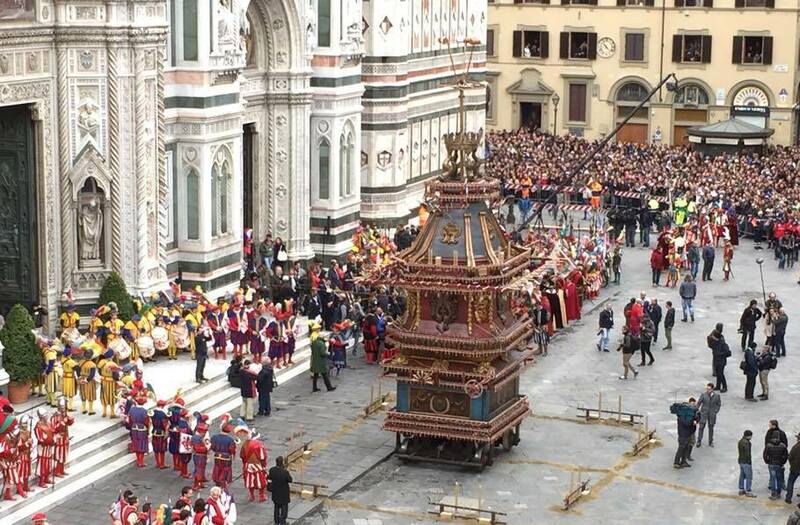 The antique cart, in use indeed for over 500 years, is 9.1 m tall (30 feet) and is hauled by a team of white oxen from Porta al Prato to the Piazza del Duomo. 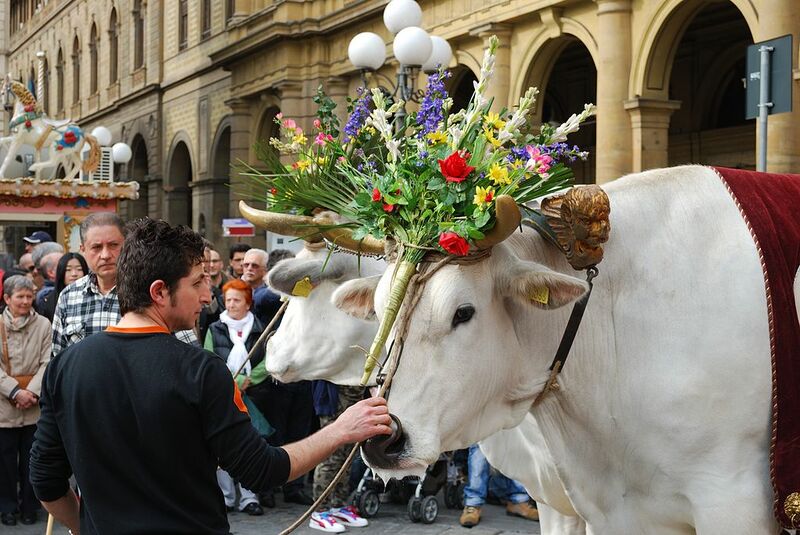 The oxen are adorned with garlands of flowers and herbs and, together with the cart, are escorted by 150 people performing as soldiers, musicians, flag-wavers and noblemen and women, all in 15th-century costumes. Meanwhile, a fire is struck using the historic flints from Jerusalem at the Church of Santi Apostoli. It is then carried in procession to the cathedral square. 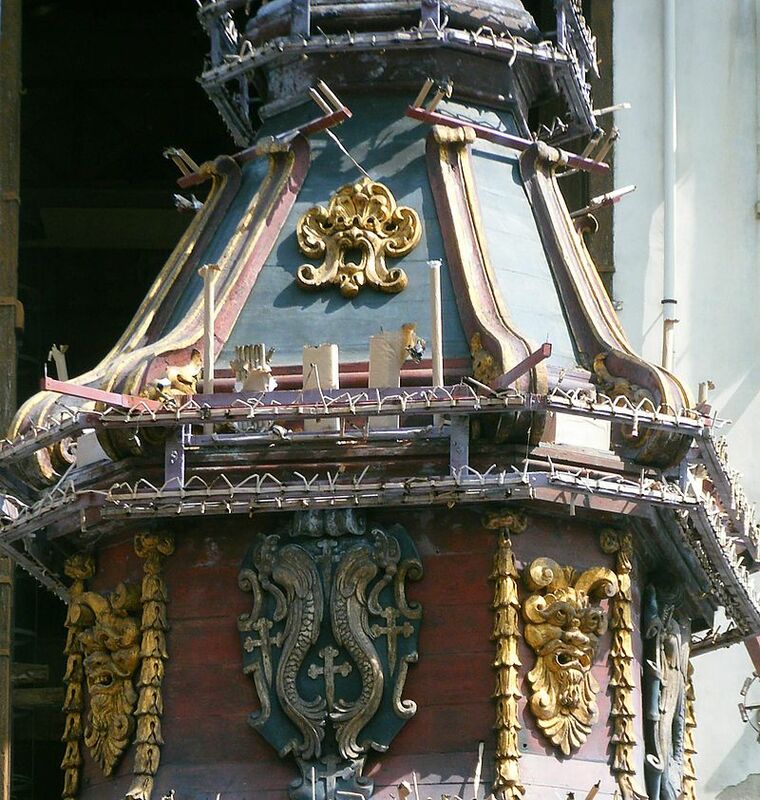 Here the cart awaits loaded with fireworks, while a wire stretches to the high altar inside the cathedral where a mechanical dove (the “colombina”) is fitted. The oxen have appropriately been unyoked. 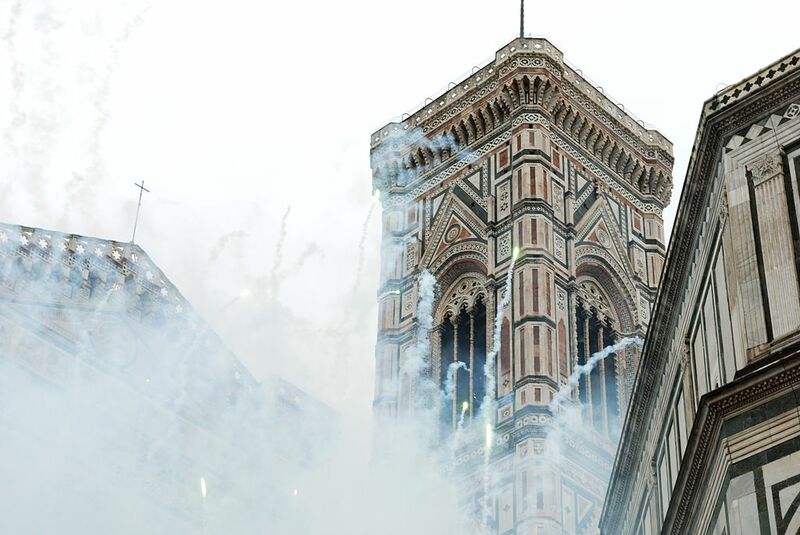 At the singing of the Gloria in excelsis Deo during Easter Mass, the cardinal of Florence lights a fuse in the “colombina” with the Easter fire. This then speeds through the church to ignite the cart outside. During all this time the bells of Giotto’s bell tower have been ringing out. The complex fireworks display that follows lasts about 20 minutes and is accompanied by much crackling and whistling. 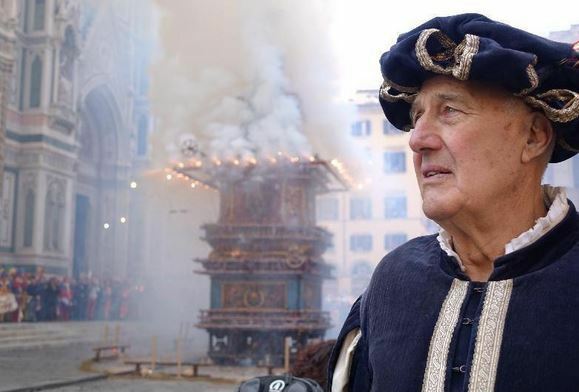 If the “colombina” has successfully set the cart on fire and succeeded on the return trip to the altar then it is believed to be a good omen, guaranteeing Florence and all Florentines a good harvest, stable life and good business. For the record, the last time the “colombina” failed its “mission” was in 1966, and in November of that year Florence was struck by a disastrous flood. The Scoppio del Carro is certainly one of Florence’s most popular and famous traditions, attracting a large international audience. Visiting Florence? Take a look at our large selection of accommodations in Florence’s town centre. Questa voce è stata pubblicata in Accommodations in Florence, Accommodations in Tuscany, Culture in Tuscany, Events in Florence, Florence, Folklore in Tuscany, Tuscan churches and cathedrals, Tuscan lifestyle, Tuscan towns and cities, Tuscany e contrassegnata con Cathedral of Florence, Chiesa degli Santi Apostoli, colombina, Easter, Easter Sunday, First Crusade, Pazzino de’ Pazzi, Scoppio del Carro. Contrassegna il permalink.